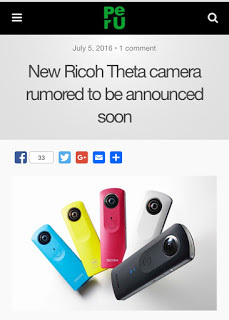 Ricoh has released a new version of the Theta each year since 2013. What we don’t know is if it’s an incremental upgrade like the m15 (which added video), or an overhaul like the Theta S.
PentaxRumors says the new Theta, to be annonuced later this year (likely at Photokina), will have 4k video. That would be a very welcome improvement that addresses the single biggest weakness of the Theta S. One technical challenge could be overheating because of the Theta’s densely-packed electronics. Check out PentaxRumors here. For other possible features of the new Theta, check here.